It’s one thing to be great at what you do, but it’s quite another to be able to convince customers of that fact. This book presents a collection of 52 business-building, loyalty-inspiring marketing ideas for anyone who wants to increase their customer base, improve customer relations and make more money doing what they love. It’s one thing to be good at what you do, but it’s quite another to convince others of that fact. That’s the role of marketing — to craft a truly compelling message about your business, product or service and to engage others to take action. But that’s easier said than done. 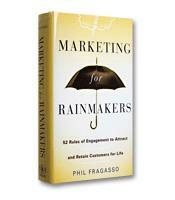 In his new book, Marketing for Rainmakers, Phil Fragasso, a veteran marketing expert with more than 25 years of marketing experience in the high-tech and financial services industries, provides the steps — 52 to be exact — for anybody who wants to grow their customer base and enhance customer relations. However the fundamental message of his book extends well beyond the sales and marketing disciplines and applies to anybody who is interested in enhancing their personal and professional effectiveness. Rather, he guides the reader on a quick and lively tour, popcorning his work with self-assessment tools, questions, examples from the world of business and sport, clever turns of the English language and illustrative quotes — all of which not only provide context to his message, but also make it eminently more readable and more enjoyable. Each of the 52 Rules of Engagement bear pithy titles that relates to the subject matter. For instance: “Get Yourself Some Culture,” wherein he talks about the importance of developing the right culture to attract and retain the best people; “Be True to Your School,” where he draws the parallel between the high school pep rally and the need to become passionate about whatever it is you do; “Sweat Like a Pig,” in which he talks about focusing on the details; and “Kill the Cat,” where he decries the decline of curiosity and challenges business leaders to keep the creative spark of curiosity alive. Fragasso’s sense of humor backdrops many of the 52 examples of the ingenuity inherent in rainmaking marketers and how they approach all aspects of their business — branding, strategic planning, tactical execution, customer relations, and building relationships. Perhaps the most compelling message of Fragasso’s book is that rainmakers don’t sell. Instead they form a genuine relationship with the client by sharing all the information needed to make an informed decision. This environment of trust will ultimately be rewarded in the marketplace.